I welcome you dear reader to the 5th issue of the JLLR. We are a fledgling journal, yet to find our wings. We started out as the official journal of ASAMI International and ILLRS, at the successful Miami congress presided over by Dror Paley. It was a landmark event where both the major world societies came together for a joint meeting. The Lisbon congress marks the culmination of efforts of many great surgeons, teachers, and leaders to unify our societies. 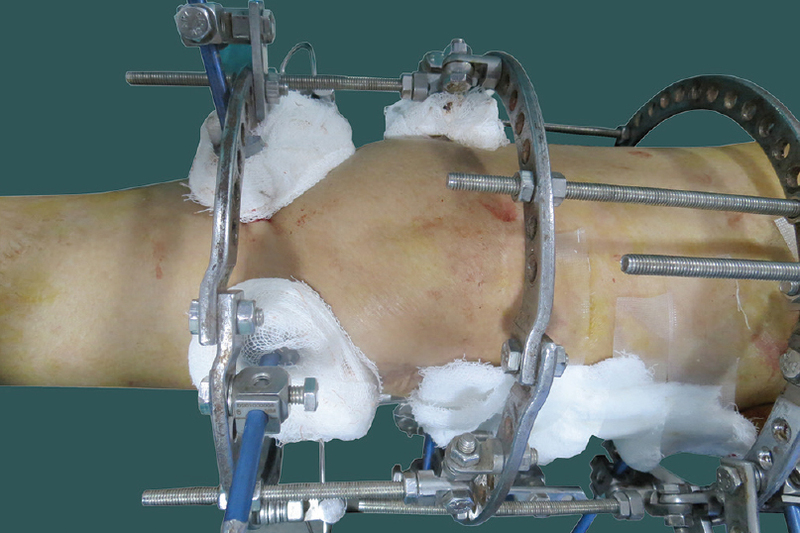 In this issue, we have an article by Kliushin and his colleagues (perhaps the world's most experienced musculoskeletal infection team) where they detail the role of Ilizarov fixator in infected total hip arthroplasty. While Ilizarov hip reconstruction immediately comes to mind, they commonly use Ilizarov as a temporary adjunct to antibiotic spacers or for resection arthroplasty. Lengthening is rarely done for these hapless patients, because of their comorbidities and advanced age. In the second paper from Kurgan, Novikov finds that contrary to most patients' expectations, the safe limit (as many have discovered with dismay) may be much smaller at 16%, beyond which complications increase. That is a valuable rule of thumb of what not to do when using the Ilizarov external fixator for stature increase. Prof. Minoo Patel has eloquently summarized the current scenario on cosmetic lengthening worldwide. He points out the pitfalls and makes his case for more regulation which will educate and protect patients, especially those who venture to distant lands as medical tourists. Guichet, inventor and visionary surgeon, gives us an insight into patients who seek this treatment and a glimpse into the future technologies which are, he points out, already on us. He has solved the important challenges of early full weight bearing and immediate resumption of activities. A deep understanding of physiology, technological improvements in instrument and implant design have made these dreams come true. In a review of pin-tract infections, Iobst lobbies for a common classification and reporting protocol of pin infections so we may be able to know and name the beast before taming it. Futuristic nanotechnology can help reduce infections by nanotubes and advanced surfaces which inhibit bacterial adherence and promote osteoblast integration. However, for those of us whose patients may not afford nanotechnology and iodine impregnated titanium pins, a brief recap of common techniques and pin site care routines in experienced institutions should help minimize infections. Problems of the pin–skin junction are minimized by gathering of skin and soft tissues in the concavity for lengthening and deformity correction. Generous release of any skin tenting prevents pressure necrosis and infection. Firmly swathing the pins by bulky gauze and small roller bandages lessens pin–skin motion and reduces infection rates [Figure 1]. We treat established infection by injecting antibiotics in the pin track. Painful pin sites are a precursor to infection, and testing for pin-bone loosening can decide which pin needs removal and replacement. If a half pin is stable in the bone and yet painful, adding another rancho cube [Figure 2] on an outrigger in series can make it painless. Deep offset spanners with tensioners help tension wires. Re-tensioning wires without pain at follow-up prevents loosening, pain, and infection. Manual tensioning of wires done properly may prevent loosening within the bolts. The wire fits in the slot of the bolt parallel to direction of tightening of the nuts. This ensures that wires do not loosen in the wire-fixator interface. 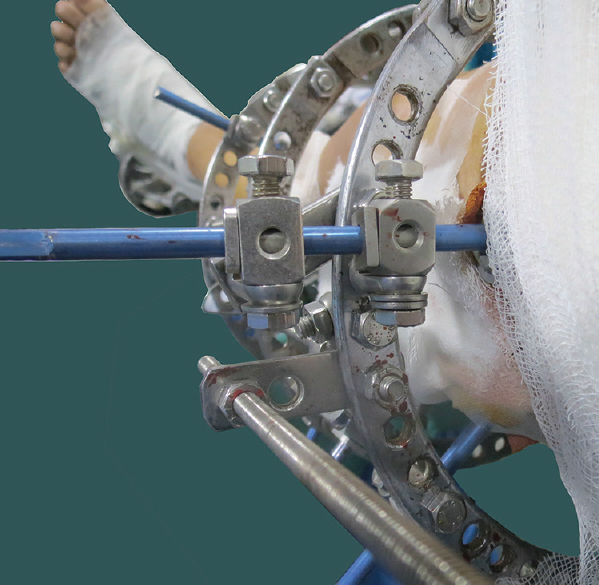 Finally, wires and pins can leave residual infection as ring sequestra or localized osteomyelitis. Debridement and scooping of the pin sites at fixator removal under anesthesia can solve this problem. Finally, I would like to share some good news. JLLR is now the official journal of the North American LLRS. The True Lok Masters Club has also made it their society's official journal. I urge all members of ILLRS and ASAMI International to subscribe to the Journal in their individual capacity. I appeal to ASAMI and ILLRS to give all their members a group subscription. I also appeal to various national ASAMI and LLR societies to seek subscription for their members. The publisher plans to send your journal for review to Science Citation index soon and later to Medline for indexing early next year. The wealth of articles already in the journal is impressive. However in the first five issues we have all of 55 to 60 articles including editorials and case reports. The Total number of abstracts accepted at Miami and Lisbon number well over 1500. We can encourage our colleagues to try to convert more of their presentations into publications. We seek reviewers who will selflessly devote time in going through articles, with the hope of improving them and helping the author to get his message across clearly. Some consider reviewing to be a thankless waste of time. The opportunity to preview firsthand the advancing wave front of knowledge could be a reward in itself. Perhaps it gives the opportunity to delve deep into the nooks and crannies of a new science. Help is at hand for those new to the rich experience of reviewing. For these reasons and more, we hope more of you will come forwards to review for the Journal-and it will improve turnaround time of articles. It is on the shoulders of these unsung giants the academic citadel rests and grows. I do agree that for many potential authors contributing to the JLLR is a chicken-and-egg dilemma. I must say the faith reposed in our journal by many prominent authors over the last two years is heartening. Given this trend, it will be Semper Ascendens for the journal. I am very grateful to Dror Paley and Kevin Tetsworth for their unstinting support. A big thanks to Reggie Hamdy and Rob Rozbruch for their contributions, valuable advice, guidance, and support. I cannot thank all reviewers enough for their selfless contributions. With their help, and you dear reader, JLLR should have a bright future. Kliushin NM, Ermakov AM, Subramanyam KN, Jaipuria J. Chronic Infection Following Total Hip Arthroplasty: Any Role for Ilizarov?. J Limb Length Recon 2017. Novikov KI, Subramanyam KN, Kolesnikova ES, Novikova OS, Jaipuria J. Guidelines for Safe Bilateral Tibial Lengthening for Stature. J Limb Length Recon 2017. Patel M. Cosmetic Limb Lengthening Surgery - The elephant in the room. Harm minimisation not prohibition. J Limb Length Recon 2017. Guichet JM. The Cosmetic Dream and Future of Lengthening Procedures. J Limb Length Recon 2017. Iobst C. Pin Track Infections: Past, Present, and Future. J Limb Length Recon 2017. Davies R, Holt N, Nayagam S. The care of pin sites with external fixation. J Bone Joint Surg Br 2005;87:716-9. Bernstein J. Free for Service: The Inadequate Incentives for Quality Peer Review. Clin Orthop Relat Res 2013;471:3093-7. Leopold SS. Editorial: CORR's New Peer-Reviewer Tool—Useful for More Than Peer Reviews. Clin Orthop Relat Res 2016;474:2321-22.